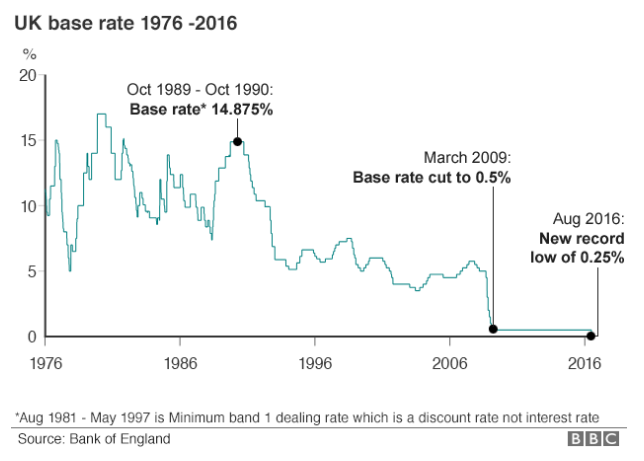 On Thursday 4th August, the Bank of England confirmed that the base rate would drop from 0.5% (the record low set in March 2009) to 0.25%. The Bank also stated that the base rate could drop further if the economy worsens. A scheme to make banks to pass on this interest rate onto households and business at a cost of £100 billion was also announced. In addition, the Bank announced further measures to stimulate the economy in the UK, including to purchase £60 billion worth of UK government bonds and £10 billion worth of corporate bonds. The total of the so-called ‘quantitative easing’ including this aforementioned additional £60 billion will be £435 billion. How will the base rate drop to 0.25% affect my mortgage? The Bank of England Base Rate is only one of the many influences on mortgage interest rates. The Council of Mortgage Lenders state that approximately ½ of mortgage borrowers are currently on a fixed rate and therefore will not notice any difference in their monthly payment until their fixed rate ends. Up to as many of 1.8 million mortgage borrowers are currently on a tracker rate, meaning that they should notice a different in their monthly mortgage payments. It is important to note that although in recent years mortgage rates have been low, during the entire term of a mortgage, interest rates can rise so it is essential to make sure that you can afford the monthly payments if interest rates rise again during your mortgage term.